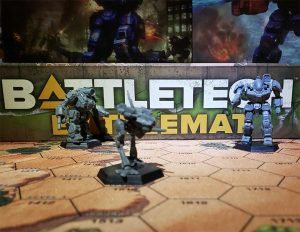 This article is about the post-Clan Invasion BattleMech. For the SLDF duelling elite, see Gunslinger Program. The Gunslinger is a product of the Clan Invasion and would not exist if not for that violent conflict. The 'Mech was jointly designed by engineers from both the Draconis Combine and the Federated Commonwealth who were in the process of assisting the Free Rasalhague Republic. 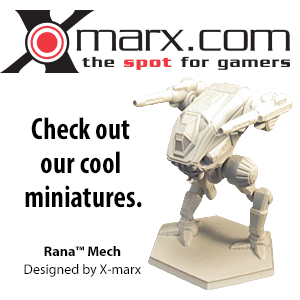 To power the Gunslinger, a VOX 255 XL Engine is used to give the 'Mech a top speed of 54 kph. This is augmented by a pair of HildCo Model 12 jump jets that allow the Gunslinger to traverse rough terrain and provide extra mobility at close ranges. The 'Mech is also equipped with a Guardian ECM Suite and a Beagle Active Probe, giving the Gunslinger superior detection capabilities and protection from advanced enemy electronic warfare equipment. Finally, the Gunslinger is protected by fifteen and a half tons of armor, giving the 'Mech excellent armor protection. The Gunslinger carries as its primary weapons two arm-mounted Poland Main Model A Gauss Rifles that can each strip off a ton of armor at ranges of over six hundred meters. As the Gunslinger closes with the enemy it is able to bring its four Defiance B3M Medium Lasers and a Defiance A5L Small Laser that help to make up for the ineffectiveness of the Gauss Rifles at extremely short ranges. Finally, to protect against attacks on its weak rear armor, the Gunslinger carries two Defiance P5M Medium Pulse Lasers. ↑ Record Sheets: Unique 'Mechs p. 14 - GUN-1ERD Gunslinger Jared - Stats and fluff for this Unique 'Mech variant was published by BattleCorps. This page was last edited on 8 February 2019, at 23:22.